Tis the Season! Share the holiday sweetness! A premium collection of seasonal Krispettes in our new gift boxes perfect for sending sweet thoughts to all the people on your holiday list. 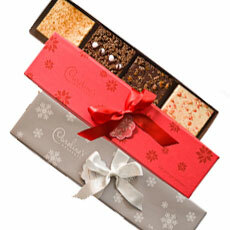 This assortment includes four Krispettes: Egg Nog, Roca Crunch, Peppermint Spark and Mint Everest. Premium Krispette Collection comes in two seasonal options: Red Poinsettia or Silver Snowflakes each tied with a matching satin ribbon and tag.